One day last week, having just arrived home and in the kitchen fetching a glass of water, the flutter of dove wings outside a nearby large window alerted me to the possible presence of a hawk in the back garden. As I approached the window, a wet dove (probably from the nearby birdbath) was driven into the window in a panic. It fell, and tottered on the ground. Its pursuer (a gorgeous Cooper’s Hawk) landed on top of the dove, mantled over the wet feathered victim, and took flight with the hapless prey (soon to be a meal) firmly clasped in its talons. This drama took seconds to unfold. Nature is predictable: it employs the unfolding of flowers when expected, foliage relinquishing color on cue, and predator and prey relationships–bound in their eternal tension–playing out regularly. Nature provides wonder at every step and turn, and gardens–nature’s intimate representatives–obliges with daily (and nightly) vignettes. I pity the poor dove, but Cooper’s Hawks must eat and in urban landscapes, White- winged doves are plentiful, and some are destined to become food. I have no photos of this dove hunt, but did spy a similar scenario while observing a pollination palooza on my White mistflower, Ageratina havanensis. 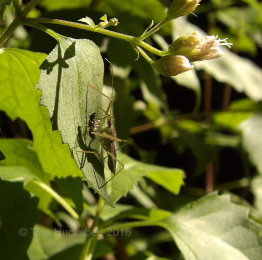 As I watched and photographed a variety of bees, butterflies, and flies, I saw a type of assassin bug, Zelus luridus, atop a leaf, clutching a native Ceratina bee. 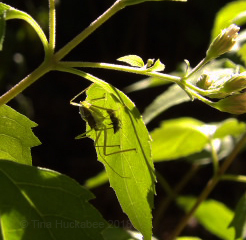 …and snapped a couple of shots (the best I could manage) and then left the predator in peace to partake of its meal. After all, I prefer mac-n-cheese. I lament that the wee bee is no longer alive to do its bee-thing, but so it goes in nature: everything must eat and many will be eaten. Nature is real and often harsh and not all stories told have happy endings for every character. That said, when I observe a garden visitor going about its business, I’m reminded of the remarkable events, positive or negative for those concerned, occurring under my nose or outside my window. This Lyside Sulphur, Kricogonia lyside, pollinated near the ground, below my direct line of vision one sparkly afternoon. Camouflaged by color and quiet, this common butterfly only caught my attention with slight movement as it work about its floral dinner table. Often more yellow and regularly in rapid flight, this one was gentle in motion as it nectared on the Prairie goldeneye bloom. For anyone paying attention, the observation of pollinators on flowers, or birds in trees and shrubs, or reptiles, amphibians, and mammals on the ground, life and death is business as usual. Nature’s complexity, with multitudes of species performing in biological choreograph, is the heartbeat and blood flow of a garden. Any notion that a pleasant surprise is a rare thing in a garden is absurd. From a bird of prey hunting, to the nearly invisible nectaring of a well-concealed butterfly, the ordinary functioning of garden, and, in the bigger picture, of the natural world, is revealed, and remarkable. Gardeners and those who observe wildlife, enjoy a vital role in promoting and protecting biodiversity. Our love of the outdoors, coupled with the drive to create and cultivate, imparts a unique perspective on the importance of a healthy environment and connection with our fellow Earth critters. 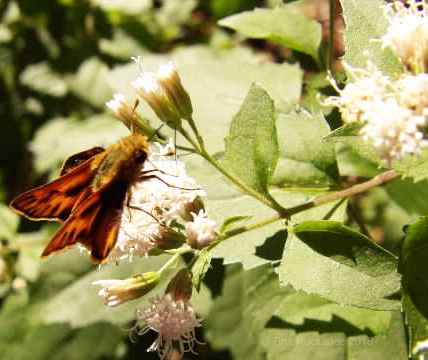 Fiery skipper (Hylephila phyleus) nectaring on White mistflower. Do you want a a garden that is alive and exciting? Make a resolution to utilize native plants in your garden: native plants are beautiful and tough, and you will see wildlife rebound and flourish in your midst. You will be thrilled by many serendipitous encounters: all breathtaking, all humbling, and all life-affirming. So ends Wildlife Wednesdays for 2018. Please leave a link to your Wildlife Wednesday post when you comment here. Happy wildlife gardening! 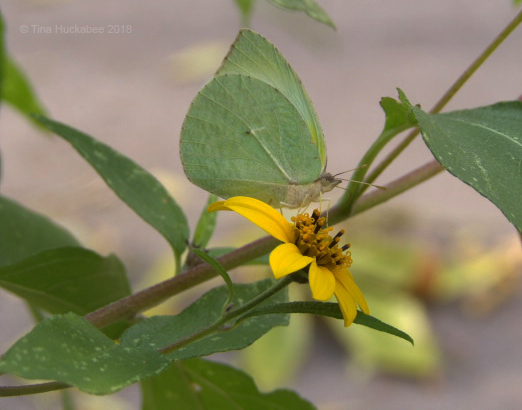 This entry was posted in Fiery Skipper, Hylephila phyleus, Kricogonia lyside, Lyside Sulphur, Native Bees of Texas, Native Plants, Uncategorized, Wildlife Gardening, Wildlife Gardening in Ausin, Wildlife Habitat, Wildlife Wednesday, Zelus luridus and tagged Wildlife Wednesday by Tina. Bookmark the permalink. Thanks so much, Karen and Happpy Chanukah to you as well! Thanks, Anna. It’s such a treat to see an owl–they’re so elusive. Bunnies are cute, but I’ll bet they’re tasty to an owl. Oh – and Happy Chanukah! A nicely reflective post and yes I do want an exciting, vital garden filled with burgeoning wildlife. I get an incredible amount of pleasure from it. I think anyone who appreciates and loves the outdoors wants to be a part of it–and when you have a garden space, encouraging wildlife by planting appropriately and gardening with care is deeply gratifying. Beautiful. The cycle plays out on a daily basis here because I chose to plant what grows best–native plants and a few well-adapted plants that seem to attract just as well. Interestingly, I didn’t plan specifically to attract wildlife. That just happened due to my plant choices. I’m just like you Shirley–it was my love of native plants that led me to observing the wlidlife they attract. There’s a nice symbiotic relationship there: native plants, wildlife, passionate gardeners! Haha–I know what you mean, but they gotta eat, so it’s all part of the show. I suspect your hawk enjoyed his/her squirrel meal. I have to admit some prejudice: I’m not as upset when a hawk takes a dove as when they go after a song bird. Your description was so good, it did not need a photo. It is hard to see animals preyed upon, but they all need to eat. Yes they do need to eat and that’s part of gardening and appreciating the outdoors. Tina is a wonderful post. It is the wildlife that follows its course. The Cooper’s Hawk is a predator and the Dove is a dam located at the bottom of the food pyramid. You were lucky to see it live or bad luck for its harshness: but Nature is like that. The wonderful thing about your Tina garden is that you have gotten prey – the native Ceratina bee – and its predators – Zelus lunidus – in all the strata of animals that live in your garden. You have created a biotope in your garden. Congratulations Tina! Wildlife in December. As I am in Madrid, the only thing I observe is every day there are less Sparrows and Blackbirds and there are more Parakeets in Argentina. The City Council has to put a stop to the invasive Parrots of Argentina that have displaced the local fauna. There are even fewer pigeons. Happy Advent Tina. Have a good weekend. Here in Spain today December 6 is a holiday because it is the 40th Anniversary of the Constitution of 1978, which started the true Democracy in Spain after years of dictatorship of Francisco Franco. You have to celebrate! Take care. Greetings from Margarita. Thanks so much! I’m glad to hear that your city council has made plans to protect the local fauna and I hope you have fun today, Margarita–enjoy your holiday! A lovely post Tina. I love the way you share your enthusiasm for the wildlife in your garden from the birds of prey down to tiny insects. Thanks so much, Chloris and thanks for reading! It doesn’t bother me too much when hawks hunt songbirds (especially when they are house sparrows). I hate it though when cats do the hunting. I cheer when a house sparrow in on the hawk menu–mean little things they are to my native song birds! I agree with you about cats, too. No mercy for House Sparrows, I say! In Japan I once had barbecued sparrow, I like to think it was a House Sparrow. Didn’t taste like much, but felt like payback. Yes, I’m sure this drama plays out in every garden situation–only the characters’ names are different! Death is part of my work as an arborist. I must write reports for the procurement of permits to remove protected old oaks in urban areas. It angers me when the old oaks that had been there longer than anyone else are killed by landscapers watering too much, especially when they express blatant disregard for the trees. Yet, I must often explain to clients that even trees that live for centuries eventually die. As saddening as it is, it is also natural. Yes it is! And you’re right, it’s sad, but part of life. When I first began paying attention to the natural world, it was the noticeable deaths that got my attention. A mother mallard would show up with fourteen babies, and the next morning there would be twelve. Then, there were eleven, and so on. I began watching more closely, and realized that the herring gulls were plucking them off the water, and the gar were pulling them under, feet first. It was really hard to accept — until I realized that, were no baby ducks to disappear, we’d be up to our hips in ducks! Yes, we’d certainly be awash in ducks, mice, rats, white-winged doves and all sorts of other things if it wasn’t for the predators. It seems harsh, but it really isn’t in that bigger picture that we must always keep in view. I like that passage very much.